Equality In Law For Women and Girls by 2030: A MultiStakeholder Strategy for Accelerated Action – a high-level event addressing the legal needs of over 50 million women and girls. 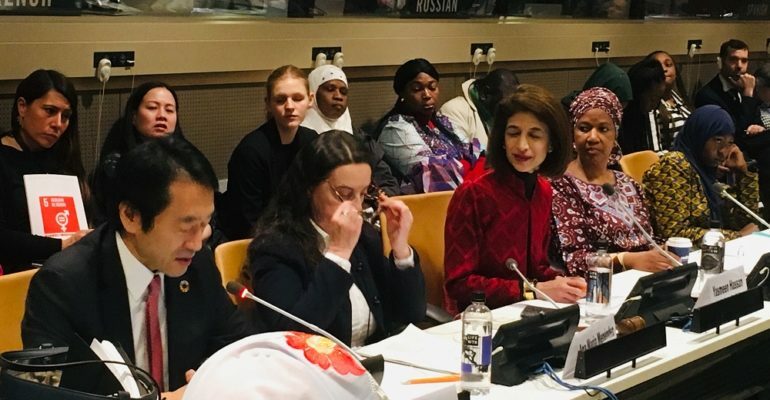 “I was fortunate to attend this important side event at CSW63, led by Executive Director of UN Women, Phumzile Mlambo-Ngcuka; H.E. Ambassador of Japan, Mr. Yasuhisa Kawamura; Ms. Jakomba Jabbi, Gambia, and moderated by the Global Executive Director Equality Now, Yasmeen Hassan, to launch a new strategy supporting the agenda for gender equality, with focus on equality in law for women and girls. Employment, marriage, protection against all forms of violence including child marriage and FGM, and free education for all girls were stated as primary focus for the strategy. Worldwide, 2.5 billion women and girls are affected by discriminatory laws and a lack of legal protection. The Executive Director of UN Women declared the strategy launched on 20 March 2019. She encouraged that states must have the political will to legally protect women and girls. 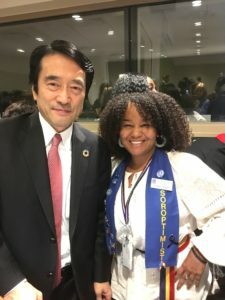 Japan’s Ambassador to the UN, reaffirmed his country’s commitment to cultivating the power of women for growth, highlighting the assistance Japan gives to developing countries for the empowerment of women and to end violence. His persuasive plea to other states to take a clear stand on how to legally protect women and girls, reminded me of the important contributions made by SIA clubs in Japan through empowerment projects that contribute to achieving the Sustainable Development Goals (SDGs). During my Federation Convention in Yokohama, (SIA), attendees were presented with some of the success stories of Soroptimist’s impact in the lives of vulnerable girls in Japan. On this high-level panel, Ms. Jakomba Jabbi, a young gender activist from Gambia, delivered a very powerful speech about the importance of all women Members of Parliaments who must be on board in order to end child marriage as agreed upon by the African Union member states. She stressed that the global strategy needs to involve everyone in order to change social norms, in addition to legal measures. Furthermore, she mentioned the important role of civil society in making real change in the lives of girls and women, and that brought to mind our many Soroptimist Projects that educate and protect girls worldwide. Two additional panels with excellent speakers representing important sectors followed. The message of unity was resonated from Latin America, Commonwealth, African Union, – Inter-Parliamenary Union (IPU), International Association of Women Judges, Muslims for Progressive Values, and UN Women representatives, highlighting specific projects that promote gender equality. In Spain, judges go to school to talk with students about gender equality early in their education. Using role reversing, where boys play girls’ roles and girls play boys’ roles, they show how very different gender-based expectations start early in life. An IPU representative emphasised that there is no substitute for a strong women’s movement which creates pressure from the bottom up. In her closing remarks, the Executive Director of UN Women called for action as 2.5 billion girls are waiting for us to get this right. She concluded by saying “CSW is nothing if we do not sort this out, if the laws are not in order in all our countries!” She encouraged us to check progress at CSW to see how religious leaders, men and boys, and academics engage in the process. Soroptimist International is doing its part to promote equality in law by offering platforms for discussions and encouraging collaborations not only during the CSW but throughout the year in our federations, regions, and clubs, where we engage community members in Human Trafficking events and help break the silence on harmful traditional practices like FGM where it most matters. We are contributing to the global partnership to eliminate violence against women and strengthen the legal responsibilities that protect women and girls.